Early morning pick up from hotel & transfer to railway station to board the superfast air-conditioned train to Agra. Breakfast in the train. Arrive Agra in approx. 02 hours & transfer to hotel. Later visit the Agra fort - the rusty and majestic red-sandstone fort of Agra stands on the banks of the river Yamuna and the construction was started by Emperor Akbar in 1566. At the Diwan-I-Am (hall of public audience), a colonnaded hall of red-sandstone with a throne alcoveof inlaid marble at the back, the Emperor heard public petitions. At the Diwan-I-Khas (hall of private audience) where marble pavilions with floral inlays lend an ethereal ambience, the Emperor sat on his gem-studded Peacock Throne and met foreign ambassadors and rulers of friendly kingdoms.Evening at sunset visit the magnificent Taj Mahal - one of the seven wonders of the world surely the most extravagant _expression of love ever created. 20,000 men laboured for over 17 years to build this memorial to Shah Jahan's beloved wife . Night stay in Agra. Early morning a second visit to Taj Mahal at sunrise , Later drive to Jaipur-the fabled “pink city” of the desert named after Jai Singh, the former Maharaja of Jaipur. This is the only city in the world symbolizing the nine divisions of the universe through the nine rectangular sectors subdividing it. The palaces and forts of the yesteryears, which were witnesses to the royal processions and splendours are now living monuments enroute visiting Fatehpur Sikri-a perfectly preserved red sandstone “ghost town" which was the estranged capital of mughal emperor Akbar, built in 1569 and deserted when its water supply failed. Arrive Jaipur in late evening & transfer to hotel. Night stay in Jaipur. After breakfast checkout from hotel & visit the majestic Amber Fort, is one that cannot be easily described. Ride up on Elephants to the former capital of the royals set against the backdrop of the wooded hills. Later visit the City Palace, Palace of Winds also known as Hawa Mahal, this elaborate building, now little more than a façade, is encrusted with delicate screen sand carved balconies from which the royal ladies, confined to their quarters, could sneak views of the outside world. Past, present and future merge at Jai Singh's observatory, where time has been accurately measured since the 17th century. Evening transfer to railway station to board the air conditioned train to Delhi, Dinner in the train. Arrive Delhi & transfer to hotel. Night stay in Delhi. 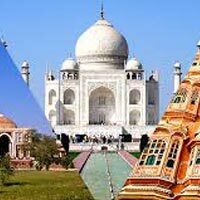 After breakfast proceed for sightseeing tour of New Delhi where ornate buildings recall the days when India was the Jewel in the crown of the British empire. 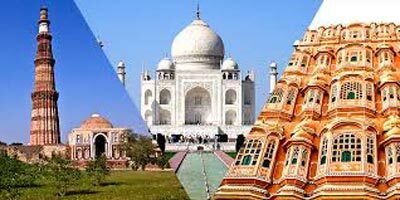 Visit the 11th century Qutab Minar, India Gate and the grand government buildings, the President’s House, Mahatama Gandhi Memorial, Also visit Laxmi Narayan temple popularly known as Birla Temple. Later transfer in time to airport to board the onward flight.